Test 1: 70% not bad. Test 4: 60% uh oh. Test 5: 60% had to turn in my motorcycle license! General Motorcycle Knowledge Quiz #05: "
Quiz #05... test your general motorcycle knowledge. Rumormill: Volkswagen interested in Ducati... still: "
It's a well-known fact that Ferdinand Pich, Chairman of Volkswagen's Board, wishes that the German automaker had purchased Ducati back in 1985 when the Italian bike manufacturer was in dire financial shape. Expanding on a suggestion from my riding partner, I'm making plans for "themed rides" for summer 2010 to visit "odd named" towns. Recall in 2008 I canvassed VA for suspension bridges (check out the Archive for May 2008 and on thru the summer months) and had a blast finding and photographing them. First, there's the issue of what constitutes an odd name. For this exercise, an odd named town is a town with a name that I consider odd. (How else are we going to do it?) There's a web site that is collecting odd named towns but it's worldwide (check it out). It occurred to me I might be able to find the names of US Post Offices listed somewhere (I did here). I realize there are probably a host of places with odd names that don't have a Post Office, but I endeavor not to let this riding theme make my head hurt. So, I culled through Virginia's 700+ Post Offices and found 14 that fit my definition of odd named town. So, be on the look out for future posts. Keep riding, it's only October! Two wheels make it right. 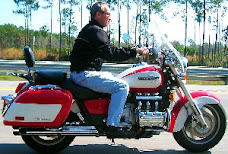 Motorcycle Cruiser magazine posted a good piece on cruisers that are sized and have a power delivery that make them good for new riders. Check it out: Click me.